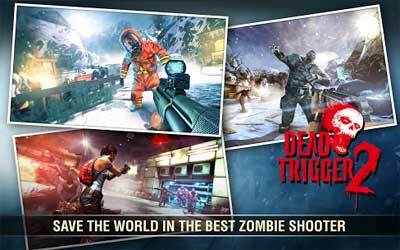 This is old version DEAD TRIGGER 2 1.1.0 apk for Android, you can install it if you want to downgrade or install old app. It is top Action apps from MADFINGER Games. Other useful feature is the difficulty setting, where the player can easily adjust the difficulty of the game. However, you need to be careful when doing that because it will affect the game loot after you complete the mission. You can use the loot to upgrade your weaponry. The interface is relatively easy. Generally, the basic shooting controller is divided into two techniques. In the initial phase of the game, you can only use the manual shooting technique. As soon as you upgrade your weapon, you can shift into automatic shooting technique. In order to improve the atmosphere and ambiance of the scene, the game incorporates cool sound effect and music. Some people consider the sound effect sounds real when they play with earphone. If you want to play first person shooter game and killing zombie with firearm, you can download Dead Trigger 2 for Android. Get the Gangster Pack! A top-grade selection of a tough guy’s favoured guns: FN FAL assault rifle & Lupara shotgun. Collector’s Hunt: A new series of seasonal tournaments: Collect more and get more (and better) rewards!